I have only a few remarks for a place with so, so many cobblestone steps. Cinque Terre truly awakens your senses. It's very pleasing on your eyes, sweet on your nose, and soft on your ears. However, it's painful on the knees, and strenuous - yet at the same time, tranquilizing on the heart. Even for us newbies, it didn't take us long to see why everyone who passed us on the "trail" had hiking poles! I'm only sorry we visited Cinque Terre at the end of our trip when we were tired and one of "the fat ones". PS. 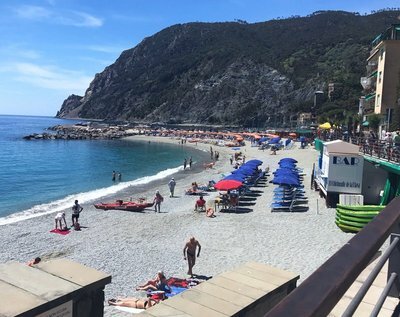 The beaches in Cinque Terre were not only difficult to get to, they were small, rocky, and crowded. I guess it's time to head home. To say that I am sad is an under statement. However, we arrived in Rome after a long travel by bus, train, and taxi. Rome is a beautiful ancient exotic city. It is a city crowded with adventure and experiences and I was soon to find out how true. We arrived at l'albergo, immediately checked in, checked the TV for English speaking channels, and checked out for the night. The next morning after a lavish breakfast our hosts shuttled us to the Rome airport where we took the airport train into the central terminal of Rome, Il Termini. 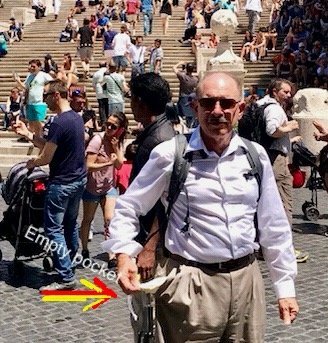 Trying to buy tickets for the Metro, the local underground train through Rome, I must have flashed my small bankroll too many times going from one ticket machine to the next searching for one that worked. The subterranean Rome trains are crowded and packed like the famous Cinque Terre sardines. A few stops and we arrived at the Spanish steps piazza. It was there I realized my money clip and my money was gone. I had been pickpocketed on the train. Joy couldn't help laughing and said, "Well now you've had the whole Italian experience". Well, gentle reader, I must confess. I knew she was right. "Che idiota! ", I thought to myself. What an idiot! How many times had we been warned by friends, my magi, and repeated overhead warnings in the train stations. Unfortunately, I had gotten complacent. Our entire trip so far without a single bad incident. All of the Italian genti during our stay have been so honest and friendly. I let my guard down and I paid "someone's business enterprise" for it. Fortunately, it was at the end of our trip and I had spent most of my cash. In effect, the loss was 55 euro and the 7 euro metro pass I had just purchased. The worst of it was my money clip with my lucky Indian chief is now in the hands of some villain. Well, I did have the "whole Itaian experience" and to tell the truth it doesn't make me sad, just stupid. Che Idiota! 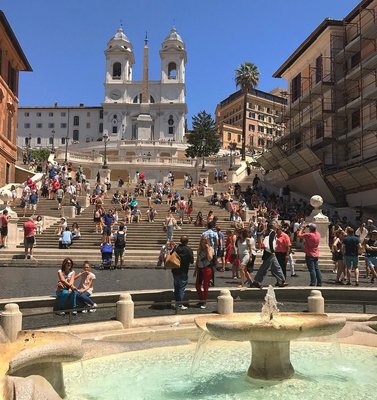 The "Spanish Steps" on a lovely day. 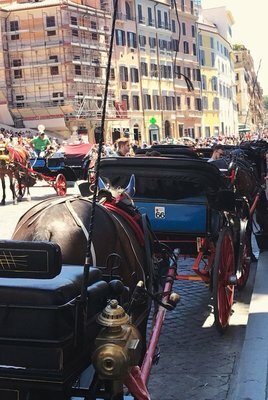 Tourist Horse carriages. Back to reality, I looked at my beautiful wife, who in her wonderful way didn't castigate me or further contribute to how foolish I felt as some might and I said, "Nay, Nay, Nay, this isn't going to ruin my day. Let's eat!" So off we went, from the Spanish steps back to the Metro and after utilizing the services of another Bancomat for cash withdrawal, we hopped aboard the underground caterpillar once again. This time with me clutching my pocket the entire time. We found a restaurant in the old city I had researched and it turned out to be a delight. 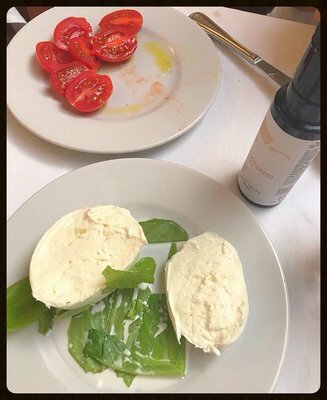 We had our 2 1/2 hour leisurely lunch at an authentic Roma antica ristorante. 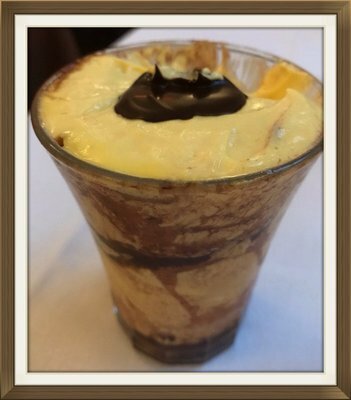 It is exclaimed by some to be one of the 3 restaurants in Rome "you shouldn't miss". I know we both would agree. 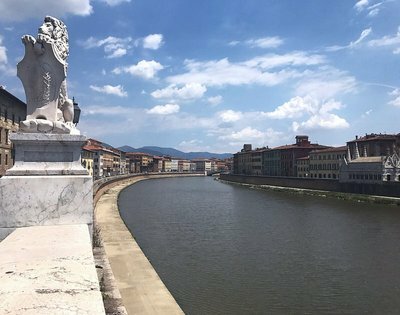 Here are some pictures and here is the Schneider trip to Italy contest I am offering. 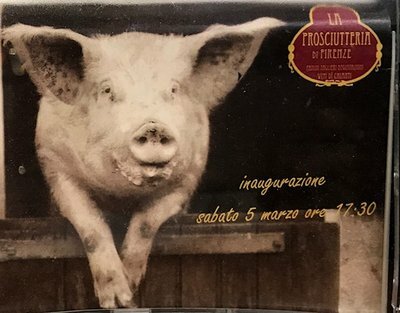 If you can name the restaurant in Rome from the clues and pictures I am about to present you will win the grand prize.... A trip to Italy with Gaius Julius Stefano e Domina Julia Gioia as your free guides and "protectors". So, my darling plebocites, here are the pictures and you've already been given the clues. Buona Fortunata!! 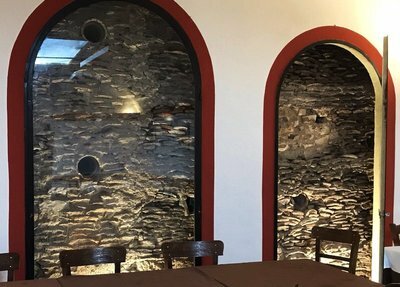 The "old wall" behind glass at the restaurant. Look at the circular artifacts. Can you guess what they are for extra credit. 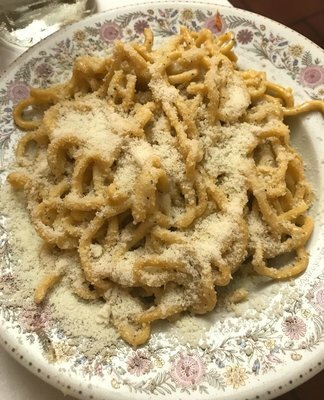 Taglierini with fresh pecorino, pepe, and parmesan. Of course there was wine, I forget to take a picture. 1. 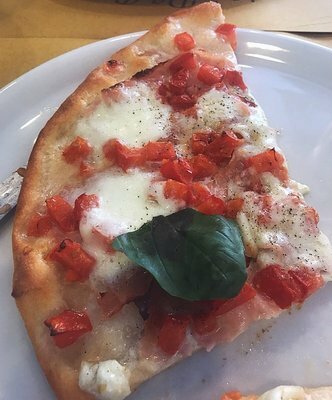 Just respond to us via email or in the comments section with the name of the restaurant in Rome. 2. 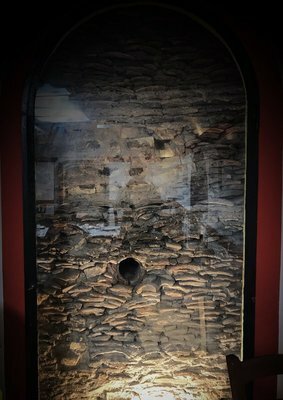 Answer the question regarding the round artifacts in the wall, should be easy if you know #1, and win an additional prize. 3. All correct contestants win US as your guides for free on your next fabulous trip to Italy. Transportation, room, meals, tax, tariffs, gifts, purchases, etc. not included. But limitless days with Gaius Julius Stefano and Domina Julia Gioia are. 4. Good luck. You can do it. Cinque Terre the part of Italy that time almost forgot. That is until the Republica di Genoa decided to continue the railway to Monterossi, Vernazza, Corniglia, Manarola, and finally Riomaggiore. This rugged mountainous terrain bordering "al mare", the sea was isolated from most of the world. Things were so bad for this area that many of the inhabitants were emigrating to survive. If only I knew then what I know now. 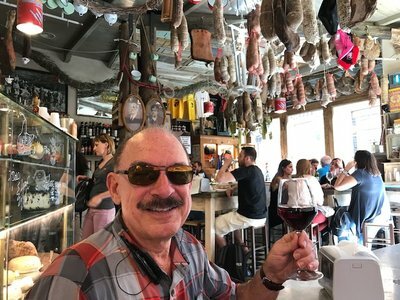 I had heard so many enchanting wonderful accolades about Cinque Terre. Which was why I put the 5 lands on our travel docket. I have to say all of the gossip is Undeniably True!! But first, a little history. I know that the few of you enjoying this want more history!! So, here it is... A few thousand years ago, a lonely traveler named Pietro brought his family to this difficult desolate ruggedly handsome jungle of a place. 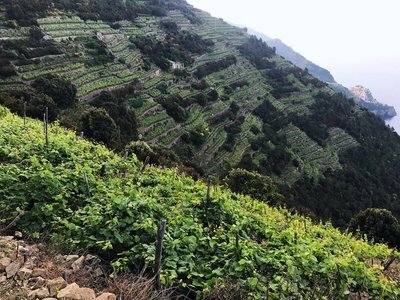 Pietro saw a landscape he wanted to cultivate, grow grapes, and produce his delicious wine. And, that he did. In the Italian way, he worked hard, poured his sweat, his heart, and his love into the land. He began producing wine that became desired throughout the "old world". So successfully that remnants of his wine and their clay amphorae have been found throughout Italy, Greece and beyond. 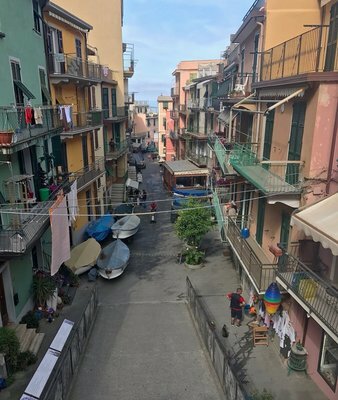 Corniglia, where Joy and I stayed. Pietro named the village he started after his mother, Cornelia. Since then the production of wine has been a major source of livelihood for the people of this region. To be successful producing wine here one had to be a farmer, architect, expert builder, vintner and more. 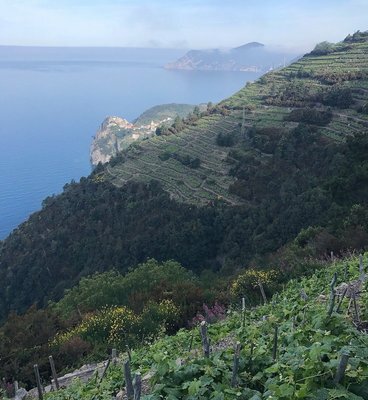 Since Pietro's day the area has been terraced with stone walls, beautifully braided groves of vines, ingenious irrigation systems, and trolleys to transport the tons of fruit produced every year. It is estimated over 2000 linear kms of stone walls, billions of tons of rock were used. Fishing was a second source of industry for the area. Unfortunately, 5Terre had a reversal of fortune. Times were hard until..... Transportation. The railway from Genoa to Levante was continued on to Monterosso and eventually all of the 5 towns. 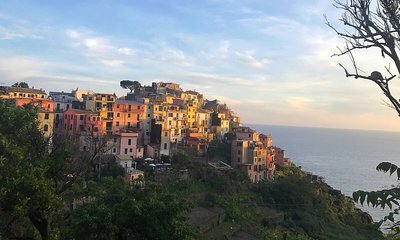 The early 1900's began a rejuvenation, Cinque Terre was discovered and the world came in trainloads, boatloads, carloads, etc. Now in each town the most popular drink served and the catch of the day is the "tourist". Sardines are served in every restaurant and tourists packed "like sardines" abound in every train, piazza, ristorante, and Gelateria. 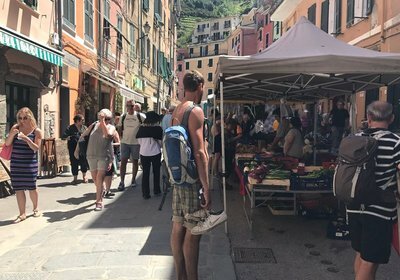 Vernazza, Tuesday street market, very touristy, lots of tchotchkes. 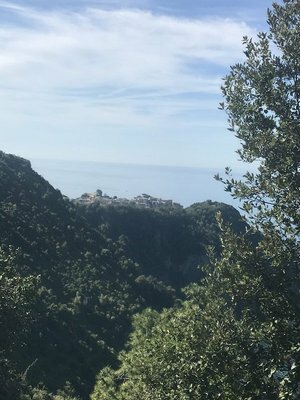 Today the most popular activity, while the farmers rest and the fishing boats sit in port, are the tourists hiking the paths in the Cinque Terre National Park from Terre to Terre . At 7.5 Euro per day this has become quite the cash crop. Our second day here Joy and I hiked the trail from Corniglia to Vernazza. A beautiful 1 1/2 hour hike up and down pretty rugged terrain of uneven rocks. Steep steps up and steeper steps down. Corniglia in the distance viewed from the high mountain path. Some courageous athletes hike 2 or more cities in a day. They are 40 years younger than us and I am proud of Mia moglie for hiking the trail without a complaint. 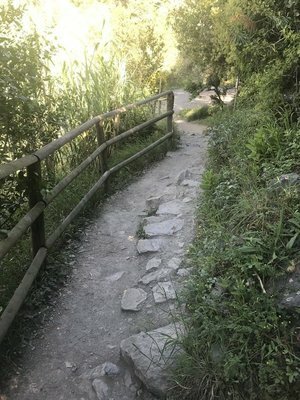 The next day at 7 AM I did the trail from Corniglia to Manarola solo. This was a 2 1/2 hour hike much more strenuous than the day before. 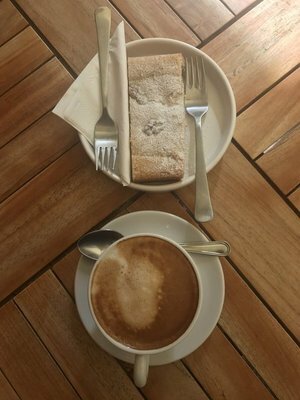 When I finished my reward was shaky legs, hypoglycemia, anaerobic debt, and a beautiful cappuccino at a Manarola cafe for 1 Euro, about $1.10. Obviously, not Starbuck's. 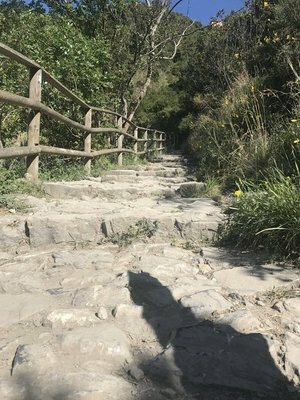 Along the hike from Corniglia to Manarola. Manarola at 9:00 AM before the tourist invasion. P.S. : Today, we jumped on the train not knowing where we'd go and landed in Pisa. 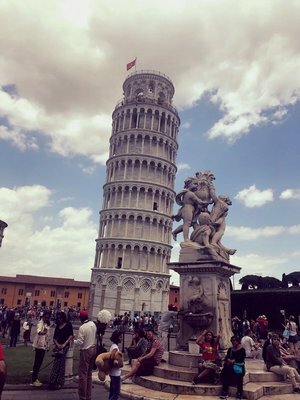 Had a delicious pizza in Pisa and visited the Leaning Tower, very spectacular. I'm glad that we did it. Bologna is a city with many nicknames, and one of them is "the fat one" (la grassa) because of its cuisine. Bologna is known for its bolognese ( ragu') sauce and its sausage (baloney), which Steven and I consumed as much as we could. Now, we have become one of "the fat ones". 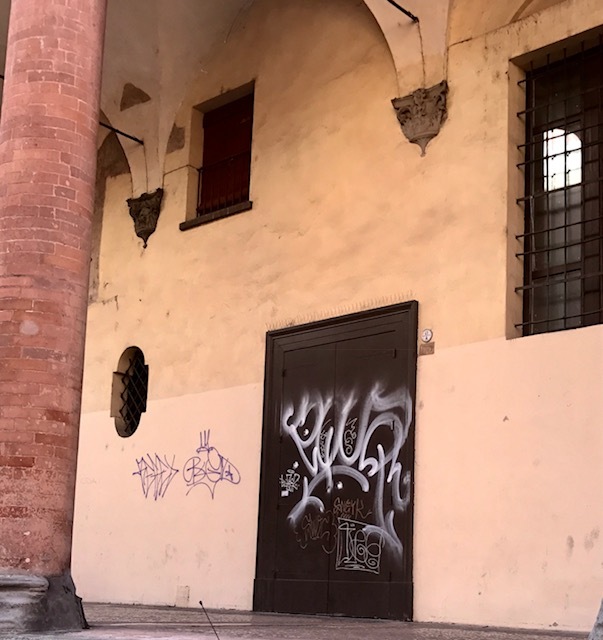 Speaking of pigs, Bologna is full of graffiti except on the churches. They must be sacred even from the piglets. If we were Catholic, we would have planned our trip to be in Bologna now. This week is a great time of celebration for the Catholics, and we just happened to fall into seeing this annual local religious event. 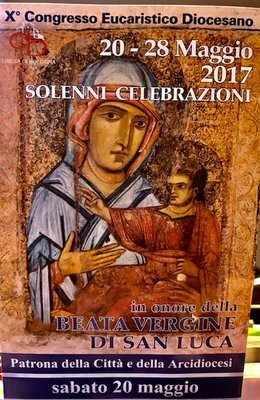 Once a year the icon of the Virgin Mary, allegedly painted by Luke the Evangelist, is paraded down from its Sanctuary on the La Guardia Hill through the town of Bologna. With much fanfare it is brought for viewing in the Metropolitan Cathedral of Saint Peter (Cattedrale Metropolitana di San Pietro). 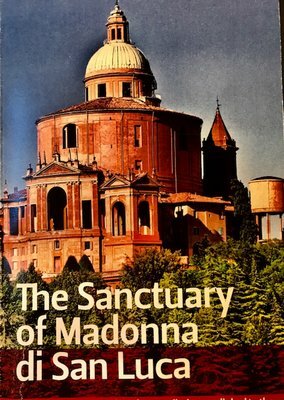 (The name Metropolitan Cathedral is so appropriate because you can't tell where the Church ends and the city begins.) This custom dates back to 1433! During the icons stay, there are on-going religious functions, so the Cathedral has a continuous flow of worshipers. People are literally bused in from all around to participate in this event. In a world where organized religion seems to be declining, you would never know it for how full this Church is --at least this week. Even in the churches, the wardrobe is much more informal than I had expected. 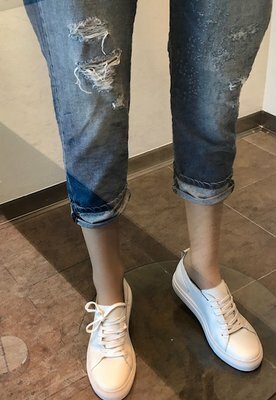 Tennis shoes and jeans, especially torn ones, are the fashion here and are worn by all ages. Ironically, I didn't bring any jeans or tennis shoes with me because I didn't want to look like an "ugly American". But guess what... I have a pair of Italian jeans now. I couldn't bring myself to buy sneakers here though for 190 Euro or more!! Speaking of American trends, I haven't seen one Starbucks yet. 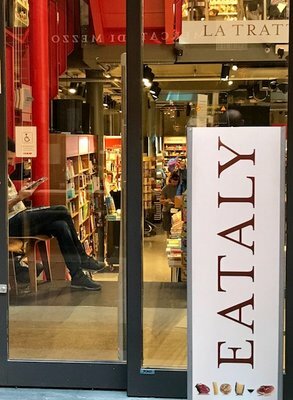 But, I have seen a couple of Eataly's. Joy and I were blessed by being at the right place at the right time in Padua, Italy. 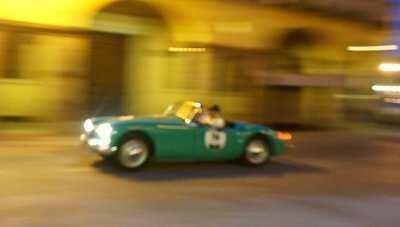 The Mille Miglia was an open-road endurance race which took place in Italy from 1927 to 1957. There were 24 races with the most wins by Alfa Romeo and by driver Clemente Biondetti. Currently, the race is limited to vintage cars produced no later than 1957. The current route from Brescia to Rome and returning had its initial stop in Padua the day before Joy and I were leaving. The cars entered the city as the sun was setting less than a block from our apartment, and the tour started the following morning about 2 blocks away. To say this event, the first in 60 years, was epic almost describes it. 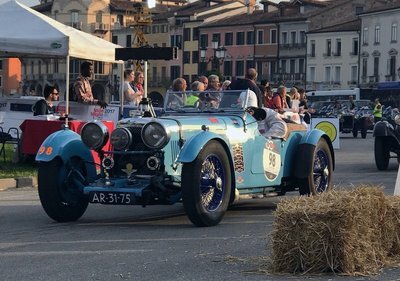 There was so much excitement and fanfare as the cars entered Padua. After dinner, Joy and I joined the mass of people and were equally enthusiastic about the arrival of the cars. 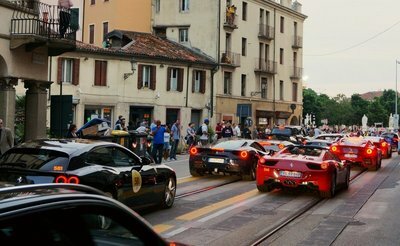 We were greeted by no less than 80 modern-era Ferrari's which came ROARING into Padua before the vintage cars. Then vintage automobiles began to arrive and raced into town as the roads had been cleared and closed for only the entrants. The next morning at 5:30 I attended the opening and start of the race. 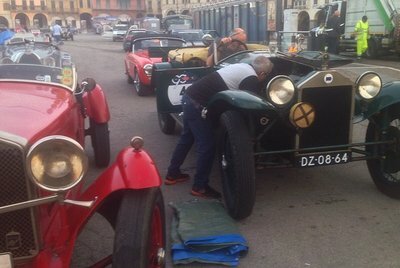 The drivers and crew checked their vintage cars. 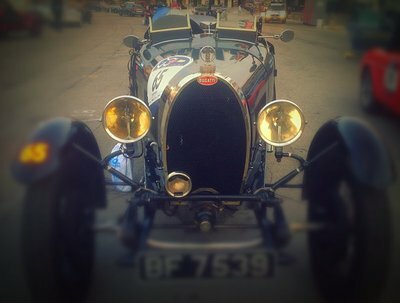 There were over 460 vintage cars in the event, including American, British, French, German, and of course Italian. Now, watch this short video of the start of the race, Keystone Cops style.